Restaurant Magazine recently announced the list of The S. Pellegrino World's 50 Best Restaurants for 2008. 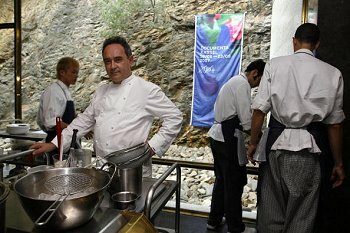 For the third straight year, Chef Ferran Adrià and El Bulli have topped the worldwide poll of restaurant industry experts. The Fat Duck, with Heston Blumenthal, again came in second place, with Pierre Gagnaire coming in third. A restaurant's ranking in the 50 Best Restaurants list is decided purely on the votes of a large panel of well-respected international judges collectively called The Nespresso World's 50 Best Restaurants Academy. The Academy comprises just fewer than 700 chefs, restauranteurs, food writers, and restaurant critics, 200 of whom were voting for the first time. Chef's Choice Mugaritz took the fourth position, its highest yet. The restaurant first charted in the 2006 list at number ten, moving three spots in the next year. Its 36-year old chef Andoni Luis Aduriz is clearly gaining in reputation, and is now nipping at the heels of the culinary legends ahead of him. Another young chef on the rise is Grant Achatz of Alinea, who at 33 was not only the highest new entry last year, but has risen 15 places to the 21st position. A new, hallowed restaurant in Spain, Asador Etxebarri, is owned by chef Victor Arguinzoinz. In complete contrast to the high-tech, gadget-loving maestros that dominate the top of the charts, the self-taught chef has elevated cooking over an open flame to new heights. He calls it "primitive cooking." Perennially popular (it has appeared on the past six lists) Fergus Henderson's St John is this year's highest climber. The restaurant tipped to break through into the Top 50 in 2009 is the Parisian neo-bistro Le Chataeubriand, owned by young Basque chef Inaki Aizpitarte.